As I started in Part 1 of these tips to shorten your brew day, I don’t have enough time to do everything I want in my life. The main motivator for me to shorten my brew days is to make time for other activities I like, and in the long run, to be able to make more beer. I know I’d love to have a couple extra hours on brew day. Even if it’s just time to sit and visit with my family and enjoy a brew from my last batch while relaxing, it would make brew day even more enjoyable. Whatever the reason you have for wanting to shorten your brew day, I think it’s a great thing to pursue. Being more efficient doesn’t mean you have to move faster or enjoy the process less. It’s about finding ways to make brewing part of your life without it preventing you from having a life. 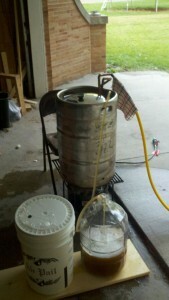 Honestly, this idea from Dan at the F It Lets Brew It! channel kind of blew my mind. I had heard the recommendation to get everything in place previously. But for some reason, I had never really thought about splitting the brewing process across consecutive days. Dan said by doing this, he can get up at a reasonable time and still be done by the time lunch rolls around. I’m definitely going to be adding this to my process. Try a split brew day and see if it helps you make time for other activities. There are times in the brewing process where you’re waiting: mash rest (45-90 minutes), settling after adding your batch sparge (10-20 minutes), waiting for boil (15-30 minutes), waiting for the next hop addition, chilling, and there always seem to be times between steps that take a few minutes longer than you think. I highly recommend cleaning out the mash tun while you’re waiting for boil to happen. When I wait until I’m done with the boil, it gets easier to make excuses to put it off. I’ve never let my mash tun sit for more than a few hours, but I’ve seen videos of home brewers struggling not to throw up while cleaning out their mash that sat for a few days. Don’t put it off. OK, that’s not what he actually said, but it’s a good summary. If you want to get more efficient at making beer, you need to do it more often. These are a few of the tips I was able to pull together to help you (and me) make our brew days more efficient and effective, so we can have more time for additional activities we enjoy. 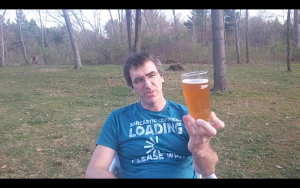 Even if that’s squeezing in one or two extra batches on a beautiful day, I hope these tips help you enjoy making beer at home even more! If you have other tips, please post them in the comments below. Really, even though I’ve been brewing since 2009, I still love learning from my fellow brewers. Please, leave a comment below.